Pomegranates are very special fruits, as you can imagine and they were even mentioned in the Bible a few times, in the Quran as being the fruits that will be present in the gardens of paradise and in Hinduism this fruit is a symbol of fertility and prosperity. It has some magic in it, isn’t it? 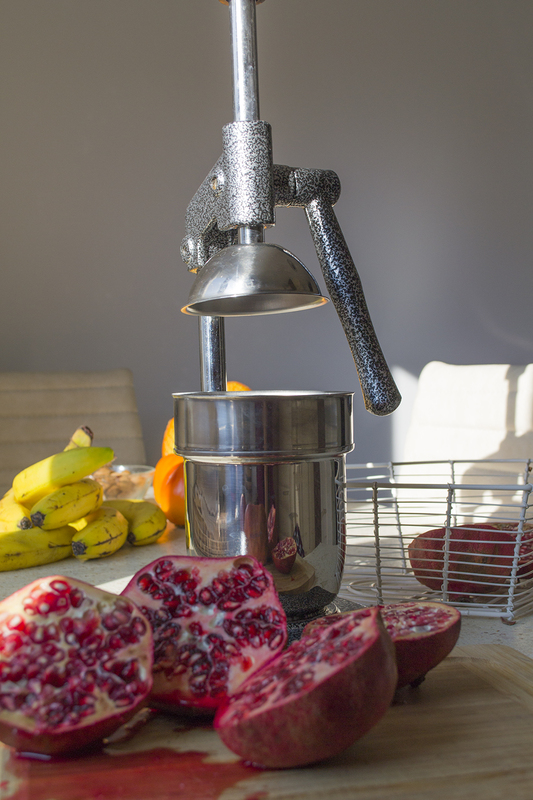 … and this is how I discovered the fresh squeezed pomegranate juice. Pomegranate juice is a tonic for the digestive system and is recognized for its ability to soothe stomach pain, in case of indigestion. For pregnant women pomegranate juice is sensational as it is very rich in minerals and vitamins and is particularly rich in folic acid. 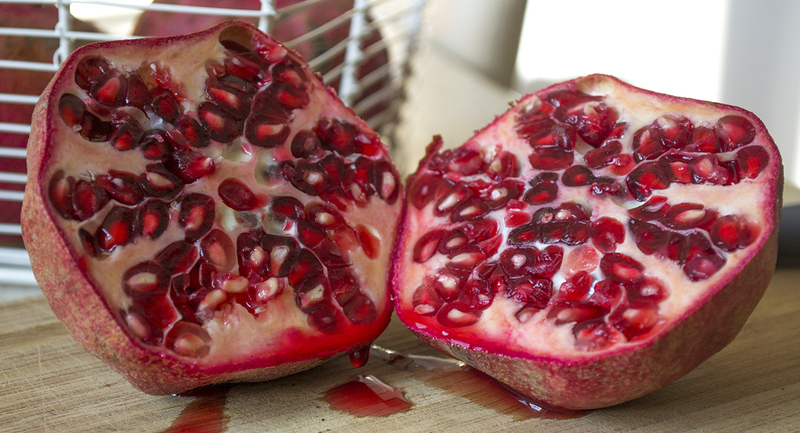 If consumed regularly, pomegranate juice reduces the risk of preterm birth. 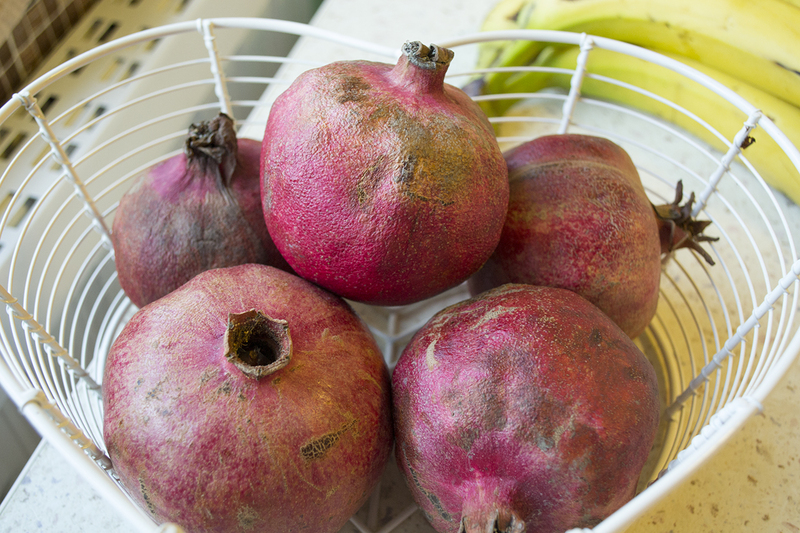 It looks like pomegranate juice, consumed regularly, prevents hair loss and its strengthening the hair roots. Helps maintaining a normal blood pressure. Drinking pomegranate juice will help you in thinning the blood and this will allow a proper blood circulation throughout the body. Pomegranates juice helps with the elimination of free radicals from the body, being a good inhibitor of malignant tumour development. For this reason, this juice promotes cell health and health in general. With such anti-bacterial and anti-viral properties, we can rest assured when it comes to colds. Consuming pomegranate juice helps the body maintain high immunity and face all kinds of viruses and bacteria. Very rich in iron, this is important for those suffering from iron deficiency anemia. Pomegranate juice is known to relieve joint pain and is known for maintaining bone health. Pomegranate juice increases appetite and is a real help for those who suffer from a lack of appetite. Pomegranate juice protects the liver and helps it regenerate by enhancing its own ability to heal by sustaining its proper function. Pomegranate juice is a widely used in the prophylaxis of asthma. Helps lower LDL cholesterol and protects blood vessels in the body. Being a good anti-bacterial, pomegranate juice helps in removing plaque in the mouth. I want to mention the fact that pomegranate juice, freshly squeezed, is beating the bare bottoms of any pomegranate juice commercially packaged and pasteurized in different ways and does not even compare in nutritional values and taste, with any other kind of pomegranate juices found in famous stores.